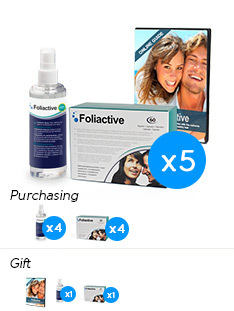 All products with the Foliactive brand are made for preventing and stopping hair loss as well as strengthen and improve its condition by working from both internally through Foliactive Pills, and externally with the Foliactive Laser and Foliactive Spray. How does the Foliactive treatment work? The main process is internally by the Foliactive Pills regenerating the hair naturally thanks to its ingredients. It strengthens and improves the hair and supplying nutrients to combat hair loss. This process strengthens the hair follicles and accelerates hair growth. The two products are for external use; the Foliactive Spray and the Foliactive Laser, stop hair loss by applying directly to the hair follicles. Externally they stimulate circulation of the scalp so all the nutrients reach the hair it needs thereby it grows stronger and healthier. Hair loss is a problem that affects both men and women and maybe caused by age (commonplace), food, heredity and even the daily routine as well as climate changes. A poor diet can lead a person to lose more than 100 hairs a day. It can also be very affected by stress or prolonged illness. Overall body strength loss, as well as necessary vitamins and minerals for a strong and shiny hair are also reasons. The Combination of all Foliactive brand products achieves much more effective results than employing them individually. What are the keys to the effectiveness of Foliactive products? Both through the food supplement Foliactive Pills, as with Foliactive Laser and Foliactive Spray, improvement in capillary blood circulation is achieved through different mechanisms: vibration, internal vitamin intake and external stimulation and repair. All products used at the same time, together provide better results because they act from several angles. They Strengthen hair follicles easily preventing hair loss. Foliactive Spray has an improved formula for more effective results. Its innovative vegetable compound, Capigen Veg, revitalizes hair and fortifies It with outstanding results. Foliactive Spray also helps improve hair quality: Reduces dandruff and grease and gives the brightness it needs. The new USB connection for the Foliactive Laser exhibits continuous improvements of the device to suit the needs of its customers. Foliactive Laser now features a new case design to store carry and store it comfortably.